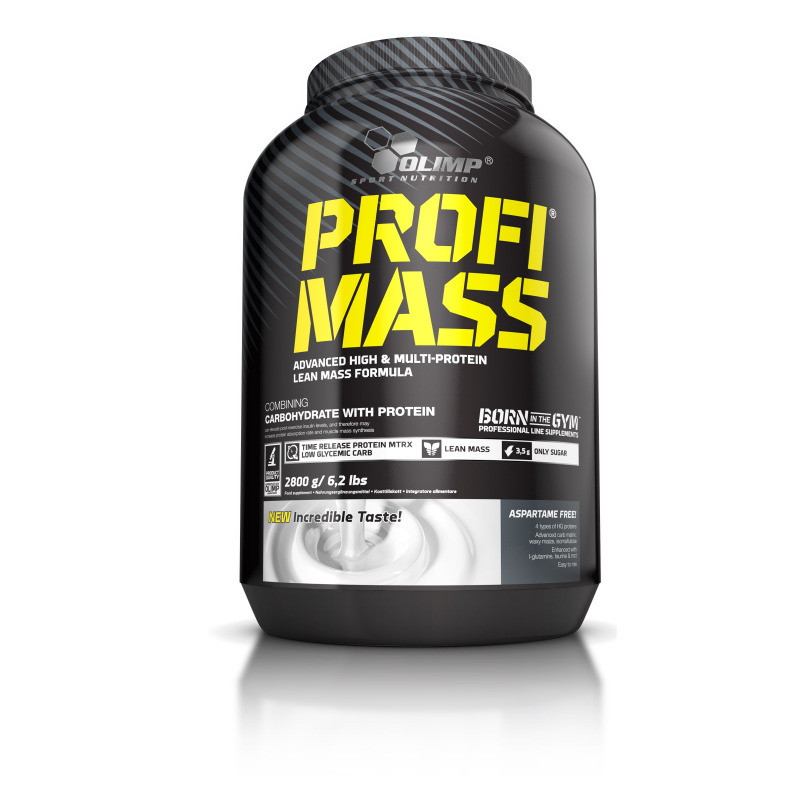 Profi Mass® Food supplement, protein-carbohydrate concentrate mix powder, especially for sports people. With sugars and sweeteners. Complex composition of valuable proteins (WPC, WPI, micellar casein, WPH) and properly compiled carbohydrates, enriched with MCT oil, and L-glutamine. Proteins contribute to the growth or maintenance of muscle mass, which is component of lean body mass. The product is designed for physically active people and sportsmen. The product is designed for physically active people and sportsmen, who strive for development of muscular strength and mass. Recommended use: take 1-4 portions a day – during breakfast, during dinner, after training and approximately 1 hour before sleep. Add 1 portion (50 g = 1,5 scoops) to 100 ml1 of water. Consume directly after preparation. Not suitable for diabetics. A varied and balanced diet and a healthy lifestyle are recommended. Ingredients: 56% protein-mix (whey protein concentrate (from milk), whey protein isolate (from milk), micellar casein (from milk), whey protein hydrolyzate (from milk)), 40% carbohydrates-mix (maltodextrins, high molecular long-chain waxy maize starch, fructose, isomaltulose*), aromas, 0,7% medium-chain triglycerides oil (MCT oil), acidity regulators – malic acid, citric acid (for all strawberry like flavours); 0,5% taurine, 0,25% L-glutamine, thickeners – gum arabic, xanthan gum, sodium carboxy methyl cellulose; sweeteners – acesulfame K, sucralose, cyclamates; 0,02% vitamins (L-ascorbic acid – vit. C, DL-alpha-tocopheryl acetate – vit. E, nicotinamide - niacin, D-biotin, retinyl acetate – vit. A, calcium D-pantothenate - pantothenic acid, pyridoxine hydrochloride – vit. B6, cholecalciferol – vit. D, pteroylmonoglutamic acid – folate, thiamin mononitrate - vit. B1, riboflavin – vit. B2, cyanocobalamin – vit. B12), emulsifier – soy lecithin; colours: carmine (for all: strawberry, cherry, strawberry-kiwi and banana-cherry like flavours), E 150c (for all: cookies cream, toffee, chocolate, coffee, ice coffee, hazelnut, cappuccino and tiramisu like flavours), riboflavin, E 133 (for all pistachio like flavours). ** Values for chocolate flavour ° Amount suggested by Olimp. Depending on consumer preferences, dissolve in 100-200 ml of water. # The variations of amino acid profile’s values may occur. This is typical for natural based products.